Falls from heights are one of the most common workplace accidents. Serious or even fatal injuries can result, which makes it vital that victims understand their rights to workers’ compensation benefits. 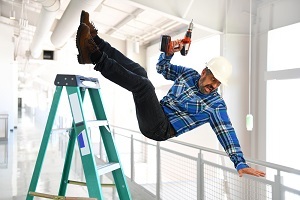 The construction industry is responsible for the majority of workers’ compensation claims involving falls from heights. In other industries, slip and fall accidents are much more common. Falls can result in broken bones, internal bleeding, traumatic brain injuries, and spinal cord injuries. Most falls are from heights of 20 feet or less, but even this distance is enough to create significant medical problems and the possibility of a lasting disability. Using guidelines or lifelines and requiring workers to wear a correctly fitting harness when working on elevated surfaces. Inspecting equipment such as ladders and fall protection equipment before each use. Following all weight limit guidelines on scaffolding. Avoiding placing ladders on uneven ground or on top of scaffolds. Positioning ladders so workers aren’t overreaching to perform tasks. Prohibiting workers from standing on scaffolding guardrails or climbing cross-braces. Cleaning up debris and wet or slippery surfaces immediately. Both part-time and full-time workers are typically eligible for workers’ compensation benefits as long as they work for an employer who has three or more employees. It does not matter how long the worker has been in his position, since workers’ compensation eligibility begins on the first day of employment. If you’re injured on the job, you should immediately report the incident to a supervisor. After your emergency medical needs are taken care of, your ongoing medical care will be handled by a doctor on your employer’s panel of physicians. This is a group of doctors selected for their familiarity with treating common workplace injuries and developing a treatment plan that will allow the worker to return to employment as soon as possible. Your workers’ compensation benefits include both medical care and income replacement. If you’re unable to work while recovering from your injuries, you’ll receive Temporary Total Disability (TTD) benefits. If you’re working in a light duty position making less money than you were prior to your accident, you’ll be entitled to Temporary Partial Disability (TPD) benefits. If your injuries have resulted in a permanent disability and you’re no longer receiving TTD or TPD benefits, you can receive Permanent Partial Disability (PPD) benefits to compensate for your permanent physical impairment due to an on-the-job injury. In the event of a workplace fatality, the spouse and dependent children of the worker can receive death benefits that provide funds for funeral and burial expenses as well as financial support to compensate for the loss of the deceased worker’s income. The rules and regulations regarding workers’ compensation are quite complex, which can often make receiving benefits a struggle. Hiring an experienced workers’ compensation attorney is the best way to protect your right to compensation while freeing up your time so you can focus on your recovery. Rechtman & Spevak’s legal team is dedicated to helping Georgia residents receive fair and timely workers’ compensation settlements. We’ve assisted employees of Home Depot, FedEx, Emory University/Emory Healthcare, Publix, Piedmont Healthcare, and other local businesses in receiving the compensation they need to move forward after a work-related injury. Please call today to schedule a free, no-obligation case review.